A spin-off topic for foo_wave_minibar_mod from the original Waveform Seekbar topic. 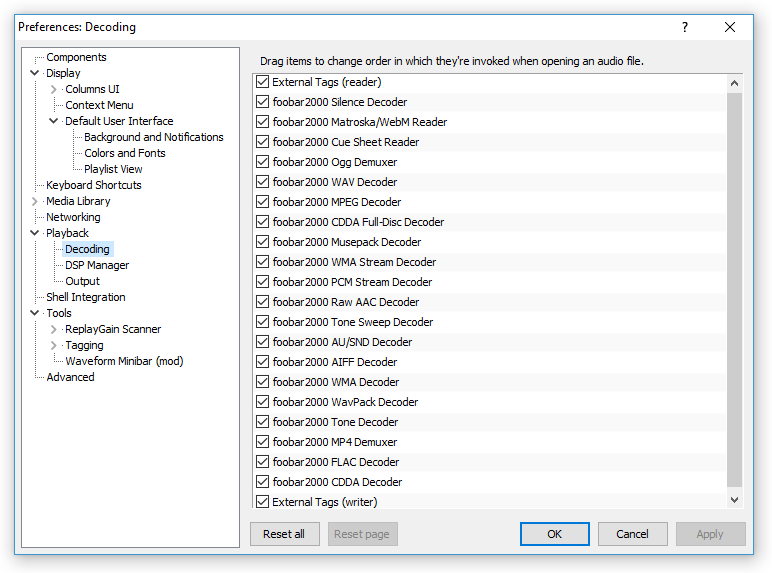 The component is downloadable for foobar2000 v1.4 series from the official repository and from my homepage. A version with statically linked C runtime for foobar2000 v1.3 is available here. This component shows a software rendered waveform for the playing track or optionally for the selected track. The waveform representation looks prettier than a static seekbar and often makes seeking to desired position easier. Some differences to original components include the ability to start playback from the stopped state instantly just by clicking on the waveform and possibility to jump to a timestamp in another track just by viewing its waveform and clicking on it. The latest version 1.0.14 that was just uploaded introduced an option to reverse the mouse wheel seeking direction. Waveform Seekbar is one of the best of foobar component to me. Thanks for the reverse scroll option. Loving the mod even more now. Couldn't live without this. Excellent component! I have replaced the stock seekbar with this and am greatly enjoying it. I have noticed that the rendered waveforms are saved and re-used. Where are the waveforms being saved? I had a brief look through the foobar2000 folder but couldn't find anything. The waveforms are stored in the file minibar.db in the foobar2000 folder. Unfortunately that is only possible when using Columns UI. Alternatively (in CUI) you can disable seekbar in toolbar and place waveform seekbar right below toolbar, as separate UI element. This is what I was doing some time ago. But now I just moved it to the bottom of window and made it much larger. Could you add an optional stereo waveform? Is that really useful? In vast majority of my music the channels are so similar that separating them makes no sense. And to see any details the seekbar needs to use twice the space. Also currently the database stores downmixed content. Enabling stereo mode would require nuking existing data and rescanning everything. I'd prefer not adding such option. When making the original minibar, a design choice I took was that it should only deal with downmixed audio and be as simple as possible with no excessive frills. I like that Case is continuing with that policy for his modified variant. If you're playing audio with dissimilar channels like chiptunes or tracked Amiga music and really need the channels, there's always the stable-and-boring foo_wave_seekbar with all its complexity. It's never been the goal of any of the components to fully represent the underlying waveform, as it's so extremely downsampled that everything visualised is a bit abstract to begin with. If you want to see the actual waveforms, I recommend Audacity or CoolEdit96. I'm just used to the stereo waveform of the original Seekbar, and I have a mono waveform now in the same (quite large) space as I had the stereo waveform (I might need to reduce the height a bit now). The analysis is very crude. It makes one pass across the audio data, splitting it into a few thousand sections. Each of those sections has min/max values and a rudimentary measure of energy computed. While it could technically be possible to integrate a RG/R128 scan with the existing analysis pass, there's no point really. Just decode the files twice, once with the minibar and once with whatever RG scanners you have. I'm aware of algorithm simplification and I don't expect studio precision. But observing huge differences in some material I listen to now Waveform Seekbar display seems to give more or less accurate information about the general level of particular tracks. While leaving some safe overhead and sacrificing couple of trimmed peaks here and there it could be away to boost some really quiet tracks. I think having couple of numbers exposed outside could open doors for some experiments. Anyway - since I discovered it I find Waveform Seekbar one of the most useful things while checking a lot of audio material (not necessarily a musical one) so thanks to all you guys involved in creating it. Sure it would be theoretically possible. But the functionality is not something I'd put in the seekbar component. Also the database format isn't optimal for that as you'd still have to parse thousands of values to find the peak. I haven't looked into the m-TAGS component but shouldn't that allow storing ReplayGain data in external file? If it doesn't, I think it would be possible to make a component that allows storing any tag data in a database or external files. No, sure I wouldn't like to put any additional burden onto this plugin. I'm just talking about exposing data that's already there (if it is there). @no9 , if you are on foobar2000 v1.4 beta you can test my latest experiment. A simple component that allows writing external tags to any file format. If the writer part is before other decoders, it will write external tag to formats that wouldn't need it. Should cause no other harm. The external tag is written to the location the source file is at with ".tag" appended to its name. If something already exists by that name it will be overwritten. Checked. It works flawlessly. Thank you very much Case! I removed the earlier attachment as I released the External Tags component on the repository (and on my site). The new version also supports tagging subsongs. @Case, I tried your new component and I was able to edit the xm module tag. Thank you for your work! I think most people (including me) store a music modules collection (for example) in packed form. This is great, thank you so much for this component! I was wondering if it would be possible to use "follow cursor" mode when foobar is not playing, and "follow playback" when it is playing? Sounds like a decent idea. I'll add it for the next version.